Raisins are a flavorful, compact package of energy, vitamins, and minerals. They’re a portable convenience food that active kids and busy adults can enjoy on the go. They’re an ideal snack food and a fantastic recipe ingredient. Raisins can add a bit of healthy sweetness to your day. Raisins are a good source of iron, calcium, manganese, magnesium copper and zinc. They are a good source of fiber and contain flavonoid compounds that work in conjunction with fiber to support bowel health. Maintaining the proper balance of electrolytes is essential for good health. Raisins are a good source of potassium, an electrolyte that supports heart health. In addition to eating healthy at mealtime, your snacks should also support your health-conscious diet. One of the advantages to including raisins in your healthy diet is that they are a good source of the B-complex vitamins thiamin, riboflavin and pantothenic acid. Raisins are a naturally sweet snack and have a higher percentage of carbohydrates than some other snack options. However, by using portion control and making adjustments that complement your dietary needs, you can enjoy the health benefits delightfully flavorful raisins provide. Raisins can be beneficial to the digestive system, intestinal tract and colon. Their high fiber content can help relieve constipation. The potassium content in raisins is credited with helping lower blood pressure and providing support to the heart. You may be surprised to learn that raisins can play an important role in your dental health. The calcium in raisins helps strengthen tooth enamel while the oleanolic acid in raisins helps protect against tooth decay. Raisins contain boron which contributes to healthy teeth. Boron is also necessary for good bone health. Adding raisins to your diet can be a proactive way to prevent osteoporosis. The iron content in raisins makes them a beneficial snack for anyone with anemia. 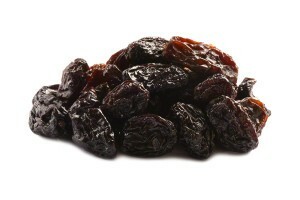 Raisins are also beneficial to kidney health, liver health and to maintaining healthy skin and hair. The key to incorporating raisins in a health-conscious diet, weight loss diet or any type of specialty diet is moderation. Raisins pair wonderfully with snack foods such as celery sticks, bananas, apples and peanut butter. You can add raisins to your homemade trail mix or granola in a portion size that you’re comfortable with. Raisins can be added to breakfast dishes such as cereal, oatmeal or pancakes. You can expand your use of raisins by adding them to main course dishes or side dishes. Think beyond the typical carrot and raisin salad and add some raisins to sweet potato dishes, sautéed Swiss chard or Brussel sprouts, broccoli dishes or potato salad. You can include raisins in a tuna salad or chicken salad recipe. Raisins can also take bread, muffins, cookies and other baked goods to a higher level of deliciousness.